A. Field dimensions: The field of play shall be rectangular. Its length being no more than one hundred and thirty (130) yards nor less than one hundred (100) yards and its width not more than one hundred (100) yards nor less than fifty (50) yards. The length in all cases shall exceed the width. BASC U13+ fields are a 100-115 x 70-80. 3. A center circle with a ten (10) yard radius. 4. Four corner arcs with a radius of one (1) yard. 5. Goal area: Six (6) yards from each goal post and six (6) yards into the field of play joined by a line drawn parallel with the goal line. 6. Penalty Area: Two lines are drawn at right angles to the goal line, eighteen (18) yards from the inside of each goalpost. These lines extend into the field of play for a distance of eighteen (18) yards and are joined by a line drawn parallel with the goal line. The area bounded by these lines and the goal line is the penalty area. Within each penalty area a penalty mark is made twelve (12) yards from the midpoint between the goalposts and equidistant to them. An arc of acircle with a radius of ten (10) yards from each penalty mark is drawn outside the penalty area. C. Goals: The size of goals to be a maximum of 24’ x 8’. A. Maximum number of players on the field per team at any one time is eleven (11), one of which is a goalkeeper. The minimum number of players to start the match is seven (7). B. Maximum number of players on the roster should not exceed eighteen (18) for U13/14 or twenty-two (22) for U15 and older. A maximum of eighteen (18) players may be in uniform and/or participate in a single match. a. Prior to a throw-in by either team. c. Following a goal by either team. d. After an injury by either team, if the injured player is substituted. 3. Players shall enter the field at the half way line with the permission of the Referee. A. The game shall be divided into two (2) equal halves of thirty-five (35) minutes each for U13/14, forty (40) minutes each for U15/16 or fortyfive (45) minutes each for U17+. B. There shall be a half time interval of five (5) minutes. Roster Size: U13/14 teams are to be formed with a maximum of 18 players; the recommended roster size is 16 players. U15 and older teams are to be formed with a maximum of 22 players; the recommended roster size is 18 players. No more than 18 players may be in uniform and/or participate in a single game. Uniforms: Team uniforms shall consist of like colored jerseys, shorts and socks. Each player shall have a number on the player’s jersey. The number shall be affixed to the back of the jersey and shall be clearly visible. Each player on a team must wear a number different from the number of every other player on their team. The official team roster shall include the number of each player’s jersey. No player names on jerseys. Any sponsor’s names, logos or other wording/graphics must be approved in advance by the BASC Board. Socks must cover shin guards and color must be consistent for the team. Any tape applied must be consistent with the sock color. Practices: Three team activities per week including games, practices, scrimmages, classroom training, etc. No single activity shall exceed 90 minutes in duration with the exception for a fifteen (15) minute allowance for warm up prior to the start of physical activity. Weeks are considered Saturday through the following Friday. Non-soccer related activities such as team parties, team fundraisers, volunteering, etc. are not considered team activities/practices in respect to this rule. 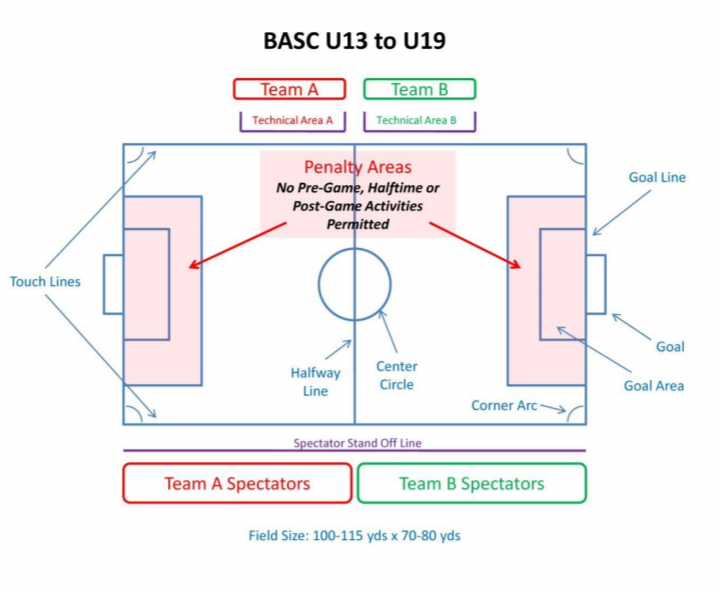 There shall be NO ACTIVITY in the PENALTY AREA (large box in front of the goal) of the U9-U19 fields pre-game, during halftime or post-game. Teams may be fined $75 for any such activity by their coaches, players or spectators (this includes children). Please Note: The U9-U19 seating arrangements are voluntary for the Spring 2014 regular season – however BASC encourages teams to comply and provide feedback to the club regarding this new policy. Teams choosing not to voluntarily participate should notify the opposing coach prior to the match and comply with the seating arrangements listed for the younger age groups. Sideline Behavior: Coaches and spectators should keep all comments positive and supportive of the players. Spectators should refrain from providing playing instructions to the players which should only be done by the coaching staff. No referee abuse will be tolerated. Coaches may be cautioned or sent off by the referee for behavior in violation of the BASC Code of Conduct by the team’s staff, players or their respective spectator sidelines. Match Officials: All matches are to be officiated by a center referee and two assistant referees. Coaching: All persons coaching BASC players must be registered with the club and have an approved background check. Only registered/approved coaches, assistant coaches, trainers and managers may coach games or participate with players during team activities practice. Coaches are only permitted on the field with the referee’s permission at a stoppage of play. Medical Devices: All medical devices (casts, supports, braces, etc) are subject to the approval of the referee with respect to player safety. Players with medical devices should have them padded in advance of the game and check in with the referee or at the HQ building prior to the match for approval. After each game, the coach in possession of the Game Forms is to phone in the score to Got Soccer using the phone #, Event ID and Pin # at the top of the game form. Coaches must maintain the game forms, in their possession, until 30 days after the season is over. Coaches must provide, to BASC, any game form requested. Substitutions may be made at any stoppage of play as listed in Law III with the permission of the referee and are unlimited. Players shall enter the field at the halfway line as the exiting player steps off the field or as otherwise permitted by the referee. In the event a substitution is requested just as play is to restart or when the substitute is not ready; the referee has the discretion to order play to be restarted despite the request so long as the coach is afforded a substitution at the next opportunity. The referee may also add time to the match for substitutions made in an effort to waste time.